Daniel Kreiss is Associate Professor in the School of Media and Journalism at the University of North Carolina at Chapel Hill. Adam Saffer is Assistant Professor in the School of Media and Journalism at the University of North Carolina at Chapel Hill. In short, elite universities on the coasts dominate Democratic hiring. Only one public university, UC Berkeley, falls in the top ten of Democratic hiring. The rest are elite private, non-profit, educational institutions. 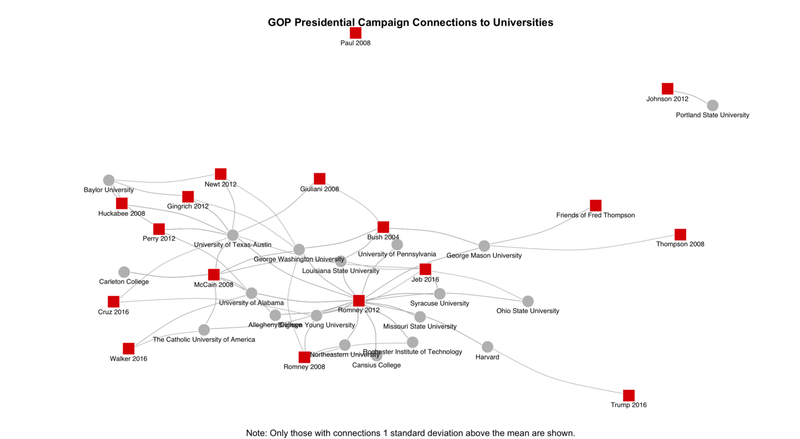 To get a different look at the data, using staffers’ educational backgrounds, we network analyzed the diversity of connections among presidential campaigns and the universities where staffers graduated. We found that Democratic presidential campaigns have continuously hired staffers from a homogeneous group of universities. 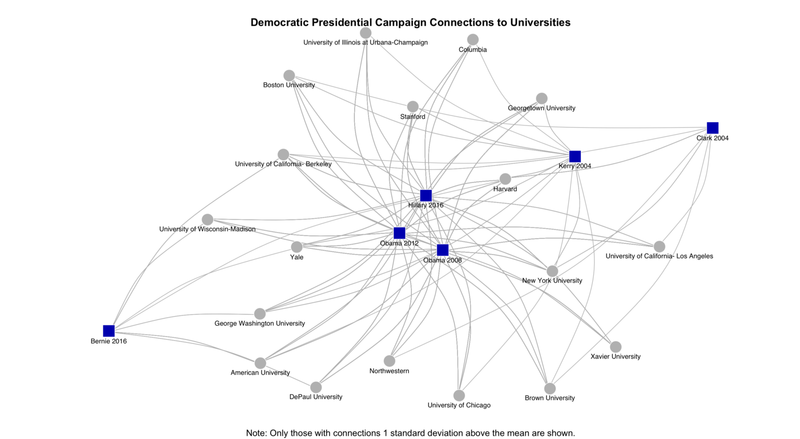 Since 2004, Democratic presidential campaigns have hired 25% of the staffers in our dataset from 15 universities including Harvard, NYU, Stanford, Georgetown, UC Berkeley, Yale, Columbia, University of Chicago, Boston University, and DePaul, just to name the top ten. A very different picture emerges on the other side of the aisle. The top three Republican schools are state public institutions: University of Texas, Austin (3%), Ohio State University (2%), and the University of Wisconsin-Madison (1%). The rest of the schools in the Republican top twenty are a mix of public and private institutions, including state schools such as George Mason (2%), the University of Alabama (2%), and Missouri State University (1%) and Brigham Young (2%). Notably, our data indicate that only 13% of Republican staffers active during the 2016 cycle graduated from an elite, private university. Republican presidential campaigns predominately hired staffers from public universities such as the University of Texas, Austin (9%), University of Wisconsin (3%), and the University of Oklahoma (3%), as well as private schools such as Syracuse (7%) and Baylor University (3%). Why do the educational backgrounds of campaign staffers matter? First, elite universities often have students from very similar socio-economic backgrounds. Compare the top three universities for Democratic and Republican campaign staffers against the New York Times database on the socio-economic composition of student bodies. For the Democrats: Harvard (15.1% of its student body come from the top 1% and 20.4% from the bottom 60%); Stanford (17.5% from top 1% and 18.6% from bottom 60%); and NYU (11.4% from top 1%, and 24.8% from bottom 60th percentile). For the Republicans: University of Texas, Austin (5.4% from top 1% and 27.7% from bottom 60%); Ohio State (2.0% from top 1% and 27.1% from bottom 60%), and Brigham Young University (4.3% from top 1% and 14.5% from bottom 60%). Unfortunately, we lack data on the income percentiles and the racial and ethnic identities of technology campaign staffers. That said, a 2016 U.S. Department of Education report documented that whites and individuals with higher socio-economic statuses are disproportionately represented at private, non-profit schools, and those that are most selective, vis-à-vis their Black and Latino and lower socio-economic status counterparts. Second, as we know from numerous academic studies in different domains, having more diverse staffers and teams can make organizations better at solving problems, more innovative and creative in their work, and improve performance. Staffers with different backgrounds often means a more diverse set of ideas and experiences that campaigns can draw on. It means resources to better question core assumptions and long-held ways of doing things. Third, from a communications perspective, our previous work has shown that greater diversity makes for more effective ways of communicating with and engaging an electorate diverse in terms of educational attainment, race and ethnicity, class, and geography. If a campaign wants to reach, persuade, and mobilize the people it targets, it needs staffers that reflect and content that appeals to who Americans are. Few people in the United States, after all, hold a bachelor’s degree (36%), let alone have attended an elite private or public university. As Democratic primary campaigns start to staff up for the 2020 presidential election, they would be well served to think carefully about the backgrounds and life experiences of their staffers. Above all, they should be deliberate in their hiring with an eye towards their campaigns containing multitudes. In the campaign world, hiring on campaigns is often dominated by well-established networks, the relationships that those close to the candidates have. Relying on staffers’ pre-existing ties has two key advantages for campaigns: staffers come already vetted through the relationships they have, and they can be found and hired quickly. And, because of the symbolic cachet that elite schools have, few ever have to face scrutiny for hiring an Ivy League graduate, even if that staffer underperforms. In sum, elite networks tend to reproduce themselves. But the downside of relying on pre-existing networks, especially those drawn from elite circles, is homogeneity. This is the tendency that a campaign only hires people with the same social, cultural, and economic backgrounds and therefore that see the world in the same way. Our public and non-elite private institutions, many far away from the country’s major cities and corridors of power, often have diverse student bodies in terms of geography, class, race and ethnicity, and life experiences. They are often more representative of America than elite, Ivy League institutions. It seems that Republican campaigns have realized this, and reach far beyond the hallowed halls of the Ivy League and other elite education institutions to help them craft their appeals to voters. If they want to win, Democrats should do the same. De Vaan, Mathijs, David Stark, and Balazs Vedres. “Game changer: The topology of creativity.” American Journal of Sociology 120, no. 4 (2015): 1144–1194. ; Gomez, L. E., and Patrick Bernet. “Diversity improves performance and outcomes.” Journal of the National Medical Association (2019).